Vodafone has announced it has developed the first ever interactive real-time music top 40. 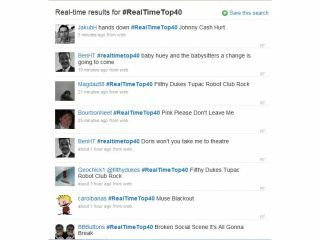 Using Twitter as a basis for its information, Vodafone is compiling all your listening data by collating musical-related tweets which have the hashtag #RealTimeTop40. As long as the tweet you send has the above hashtag, and the name of artist and song, then your data will be included in the top 40. The 'real-time music top 40' is all part of an initiative to promote Vodafone Music, a service available to Vodafone UK customers, which gives consumers access to one million unlocked DRM free tracks. The top 40 has been created in conjunction with software developer Ben Marsh, who also developed the #ukhols Twitter/Google mash up for Vodafone. If you want to see what all the fuss is about, then get yourself over to www.realtimetop40.com now.